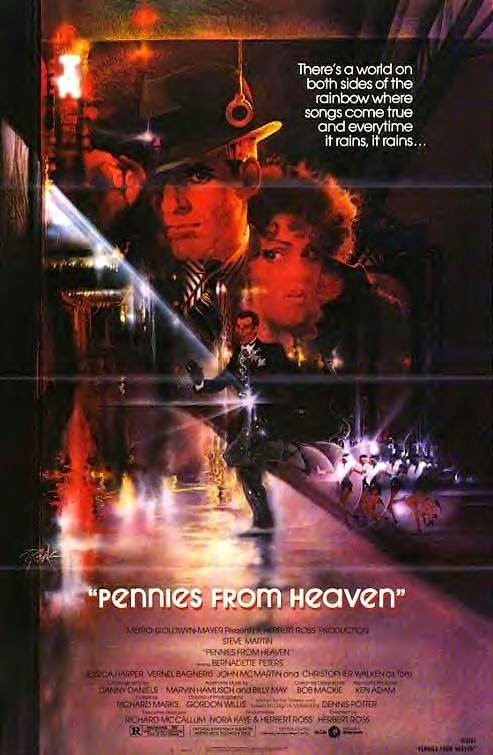 Tag line: "There's a world on both sides of the rainbow where songs come true and every time it rains, it rains..."
Pennies from Heaven, a 1981 movie directed by Herbert Ross, is a very unusual musical in that none of the actors actually sing. Set in the Depression, the film utilizes the music of the 1930s (period recordings are used, with the actors lip-synching to make it look as if they’re belting out the tunes). What’s more, the music in Pennies from Heaven serves a very specific purpose, reflecting the hopes and dreams of its main characters while also offering them an escape of sorts from the crushing reality of their everyday lives. The year is 1934. Arthur Parker (Steve Martin) is a Chicago-based salesman specializing in sheet music. Unfortunately, like most suffering through the Great Depression, Arthur is having trouble making ends meet. His wife, Joan (Jessica Harper), is supportive but cold, and the bank refuses to give him a loan to expand his business. Not to worry, though, because when things don’t go his way, Arthur simply escapes into his fantasies, all of which resemble a big-budget Hollywood musical number. While on the road trying to stir up some business, Arthur meets Eileen (Bernadette Peters), a shy, withdrawn schoolteacher with whom he has an affair. Juggling two women while, at the same time, opening his own record store, Arthur‘s life becomes more difficult than ever, yet through it all, he has his music, and his imagination, to carry him through. There are moments when Pennies from Heaven comes across as humorous; the first time Steve Martin’s Arthur opens his mouth to “sing”, he does so with a woman’s voice (Connee Boswell’s, to be precise. The song is 1932’s “I’ll Never Have to Dream Again”), but make no mistake: this is a straight-up drama, often delving into serious, even dark territory (a minor character, a blind girl played by Eliska Krupka, is raped and killed, a murder that will come back to haunt Arthur later in the film). In fact, Pennies from Heaven can best be described as having a split personality. At times dealing with such real-life issues as deception, rejection, infidelity, and failure, the movie also features sequences of unbridled enthusiasm, musical numbers that emphasize the positive, where all is right with the world. In an early scene, Arthur is trying to secure a bank loan, yet has no collateral. The Bank Officer (Jay Garner) naturally denies his application, at which point the film bursts into song, a wild and flashy fantasy sequence featuring The Carlyle Cousin’s 1931 tune “Yes, Yes!” in which Arthur imagines that his request for capital has been approved. In the 1930’s, when the Great Depression was in full swing, people turned to popular culture, the cinema included, to take their minds off their troubles, and one of the more popular film genres at the time was the musical. Movies like 42nd Street, Footlight Parade, and Top Hat whisked audiences to wonderful new places where, for an hour or two, they could forget their worries. While paying tribute to this era’s musical films (there are a handful of stylized dance sequences that would have impressed Busby Berkeley himself), Pennies from Heaven is also an homage to the escapism these movies offered, creating a world where happiness is but a pleasant thought away. Equal parts ecstasy and despair, Pennies from Heaven is a wild ride, and when all is said and done, you’ll be happy you climbed on board. I haven't seen this film all the way through, but what I watched was years ago. Probably around the time it cam out on VHS. Didn't Dennis Potter write the script for this, which makes some sense because his The Singing Detective (BBC series, mini-series, TV movie?) did similar things with the use of old time musical numbers being an extension of the protagonist's emotions. It sounds like a cool idea. Watching those old musicals from the Depression era, I think modern audiences are either put off by how simplistic they are or I wonder if they think audiences were simplistic without considering the very real idea of escapism and that why those films were created. So, the schizophrenic nature of this film seems understandable because now we see both sides of that emotional coin side by side. Like many people going to see this first-run, I assumed it was going to be a comedy (they advertised it that way). Little did I know I'd be viewing one of the most depressing films of all time. I liked it, but most people wanted to kill Steve Martin for it.